I think it’s important for you to realize that it’s natural for parents to end up on different pages; sometimes infrequently, sometimes often. People will disagree about a lot of core issues in a marriage; it’s very normal for two adults to see the world in two different ways. But things that are subtle differences can become more burdensome over time. So often, something that starts out as a little conflict can grow until you and your spouse aren’t on the same page in dealing with that issue—for some reason, you aren’t able to develop a common strategy for dealing with the problem. This may be okay in some instances—let’s say you keep your car very clean but your spouse is a little more lax, and the two of you learn to live with that. But when it comes to your children, it’s a whole different ball game. I think people have to really take a look at themselves and step back and say, “Our children are very important to us, so we need to come together on this.” It’s very important to come up with a cohesive plan to which you both adhere—or your child is liable to fall through the cracks of your lack of agreement. And this is especially true when you have a child with behavioral problems, because besides putting extra stress on a marriage, you need to be united in teaching that child firm, clear rules. The problem is that a lot of parents aren’t modeling this right now. They may be saying “You’ve got to respect authority” but then they give a policeman the finger with their six-year-old sitting in the car. That’s why I always stress the importance of being a role model to parents. I personally believe in a process where kids are given responsibilities, taught how to accomplish those responsibilities and then held accountable for meeting their responsibilities. So for parents, that means you give clear instructions to your children, do whatever it takes to make sure your child understands what’s going on, and then you hold them accountable for maintaining the level of performance that you expect. An example might be how they should treat their siblings. You tell them what the rules are: no hitting, for instance. You make sure they understand how they are supposed to behave, and what happens if they don’t—what the consequence will be. And then you hold them accountable and follow through. You have them make amends if necessary. JL: If you and your spouse disagree over how to handle your child’s behavior, it should never be discussed in front of your child—period. Realize that when one parent undermines the other parent in this way, it hurts both parents. That’s because your child is going to question both of you. Sometimes, kids feel like they have to choose sides. And not only that, they’re going to feel insecure that the two of you don’t seem to know what to do—because after all, if you knew what to do, you’d be agreeing. So these things have to be handled privately. It’s the same way that you can’t disrespect the teacher’s authority without undermining your own later on. The attitude that, “Well, my teacher is stupid and I don’t have to listen to him,” quickly becomes, when your child gets to adolescence, “My parents are stupid and I don’t have to listen to them.” And so the more you disrespect other legitimate authority figures, the more you’re undermining your own authority. So take one thing that you can agree on and then start making limits on that—and being supportive of each other. I think that if you can agree on one thing, it’s easier to move on to another. Once one thing is working, you can build some momentum and form the basis of an agreement on parenting your child. Realize that a compromise has to be made when your spouse says, for example, “I don’t think we should have a bed time,” and you say, “Our son should go to bed at eight o’clock.” You have to be open to your spouse’s statement. Here’s another example: you’ll often have two parents disagreeing over sibling fighting. One parent will say, “Nathan is picking on his younger sister. He’s being hurtful and needs to be given consequences.” And the other parent is responding with, “Yeah, but Emily teases him a lot. She brings it on herself.” These two parents have to sit down and figure out what they’re going to do about the situation together—and out of earshot of the child. And both parents have to be open to the other person’s ideas and perceptions. 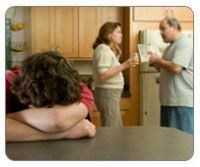 The parent who’s trying to give consequences to the older child has to be able to be heard by the parent who thinks the younger child is setting the situation up purposefully. Compromise in this situation would have to do with holding both kids responsible so that there’s a consequence for antagonizing, just like there’s a consequence for hurtful behavior. JL: When one parent is stuck in the role of disciplinarian and the other is the nice guy, we call that “good cop/bad cop parenting”. If you’re tired of playing the role of the “bad cop,” you need to talk to your spouse. Ask them to pick one thing that they’ll take the lead on—maybe it’s doing homework or bedtime. After they’ve taken that duty on for awhile, you can sit down again and talk about some other areas of limit-setting they could take the lead on. Also, remember that it’s not unusual for one person to be a stronger limit-setter than the other, because everyone’s personality is different. It’s common for one of the adults in the marriage to be a stronger in that regard than the other. As long as both adults agree and are supportive of one another, there shouldn’t be a problem. I go back to the idea that my son didn’t need two of me—he needed one of me and one of my wife. We worked together to agree on everything and we both articulated our position when dealing with our son and his behavior. If you feel like things have been slipping, you can start the conversation by saying, “Look, I feel like we’re out of sync lately. 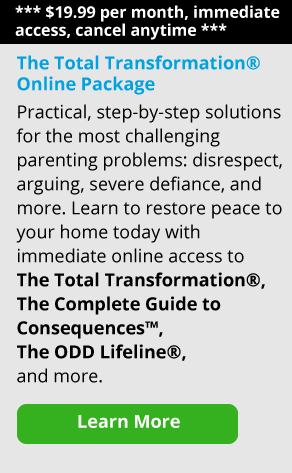 Let’s get back to being on the same page with Tommy.” If you’re not able to do that, then unfortunately you decrease the likelihood of your joint parenting being effective. Never forget, we’re talking about effective versus ineffective parenting, not good versus bad parenting. The bottom line is that if you’re not on the same page, you’re not going to be as effective. James, you mention that kids sometimes use our lack of agreement to manipulate and take advantage. What do you mean by that? JL: Kids are natural manipulators, just like puppies are—it’s a survival skill. The higher your cognitive abilities, the more natural it is to try to manipulate your environment. That’s why chimpanzees bang nuts with a stone until they open but cows don’t. It’s the same with children, who will naturally try everything they can to manipulate their environment—and that includes manipulating their parents. Adults do the same thing—have you ever tried to manipulate your boss when you wanted something? And do you remember trying to manipulate your own parents when you were a teenager? But here’s where it breaks down in a family: if you disrespect your spouse in front of your kids or talk about them behind their back, you’re setting up a very serious situation. Make no mistake, eventually your kids are going to feel like they don’t have to respond to your spouse. They manipulate that by saying, “Mommy doesn’t make me do it that way,” or “Daddy said I could.” You’ll hear kids say that all the time; it’s an attempt to manipulate and divide the two of you. I think when you show kids that you’re in opposition to your spouse’s approach—when you show that you feel it’s stupid or irrelevant or impractical—what you’re doing is inviting your child to be disrespectful to your spouse. He will use that information to split the two of you and manipulate you against the other. And if you don’t get on the same page, that’s going to create real problems in your family. JL: To go back to our original analogy, when one parent is entrenched in opposition to the other parent on any one page of the marriage, it affects all the pages in the book. So if one parent doesn’t think the other parent is trying hard enough to take on more duties around the house, it affects the family globally. I’ve found that most parents aren’t able to simply be frustrated with their partner in one area and remain on common ground in other areas unless they consciously work on it. In the same way, once you start working on things together—once you choose that “one thing” that you will start doing the same way—it brings you together as a couple, and presents a united front to your children.